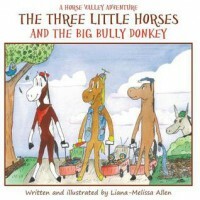 Donkey’s Kite is the second book in the Horse Valley Adventure and just as cute as The Three Horses and the Big Bully Donkey. Lax, Max, and Jack haven’t changed much since the first story which is a little unfortunate, but changes do not happen overnight. Donkey, however, has really changed and is now best friends with the three brothers. I felt Donkey had a bit of a self esteem issue thinking his kite wasn’t good enough and that he isn’t good at things. Unfortunately, he also got a taste of his own medicine when some geese starting bullying him. What I really liked it that Gutsy reminds me of the Ugly Duckling. She has been bullied before and knows what it feels like so she defends Donkey and helps him. In the end, the three horses, Donkey, and Gutsy all become friends and build a kite together so that no one is left out and that they all have a kite that is fabulous rather than each bragging about their own kite and making others feel bad. Again, I think this is a great book that children can take away a lesson from. I would say this is around the 3rd grade reading level, but would definitely recommend to parents and teachers to read to their kids. The kids will love the illustrations and the lessons are valuable!